New Mexico ">[ˈnweβo ˈmexiko]; Navajo: Yootó Hahoodzo [jò:txó hàhò:tsò]) is a state located in the southwestern region of the United States of America. It was admitted to the union as the 47th state on January 6, 1912. It is usually considered one of the Mountain States. New Mexico is fifth by area, the 36th-most populous, and the sixth-least densely populated of the 50 United States. 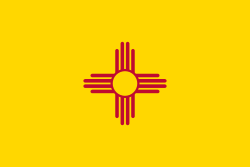 New Mexico (Spanish: Nuevo México [ˈnweβo ˈmexiko]; Navajo: Yootó Hahoodzo [jò:txó hàhò:tsò]) is a state located in the southwestern region of the United States of America. It was admitted to the union as the 47th state on January 6, 1912. It is usually considered one of the Mountain States. New Mexico is fifth by area, the 36th-most populous, and the sixth-least densely populated of the 50 United States. Inhabited by indigenous peoples for thousands of years before European exploration, New Mexico was colonized by the Spanish in 1598 Imperial Spanish viceroyalty of New Spain. Later, it was part of independent Mexico before becoming a U.S. territory and eventually a U.S. state as a result of the Mexican–American War. Among U.S. states, New Mexico has the highest percentage of Hispanics, including descendants of the original Spanish colonists who have lived in the area for more than 400 years beginning in 1598. It has the second-highest percentage of Native Americans as a proportion of the population after Alaska, and the fourth-highest total number of Native Americans after California, Oklahoma, and Arizona. The major Native American nations in the state are Navajo, Pueblo, and Apache peoples. The demography and culture of the state are shaped by these strong Hispanic and Native American influences and expressed in the state flag. Its scarlet and gold colors are taken from the royal standards of Spain, along with the ancient sun symbol of the Zia, a Pueblo-related tribe. New Mexico, or Nuevo México in Spanish, is often incorrectly believed to have taken its name from the nation of Mexico. However, Spanish explorers recorded this region as New Mexico in 1563, and again in 1581, when they incorrectly believed it contained wealthy Mexica Indian cultures similar to those of the Aztec Empire. The name simply stuck, even though the area had no connection to Mexico or the Mexica Indian tribes. Mexico, formerly a part of New Spain, adopted its name centuries later in 1821, after winning independence from Spanish rule. New Mexico was a part of the independent Mexican Empire and Federal Republic of Mexico for 27 years, 1821 through 1848. New Mexico and Mexico developed as neighboring Spanish-speaking communities under Spanish rule, with relatively independent histories.